Jerry Owens will present 2 beekeeping classes this spring at the Dakota Middle School (formerly Rapid City High School) located on 6th and Columbus. Please check in with the Community Education Service beforehand. But a swarm in July – is not worth a fly. Questions and conversation about the subjects addressed above and other items of interest. March 13: How are things going? May 4 (tentative): Arrival and distribution of new NUCs. November 13: How are things going? No Cook Candy-Board Feeder & Recipe from Tom Allen — via the Honey Bee Suite site. Local Foods Conference – November 6 & 7, 2015 in Deadwood, SD. Jerry Owens will be a presenter on Friday afternoon presenting on the HOW TO OF HONEYBEES. I have attached a registration brochure for the event with contact information. The list of sessions is in the brochure. The deadline for registration is October 30th. See attached brochure. 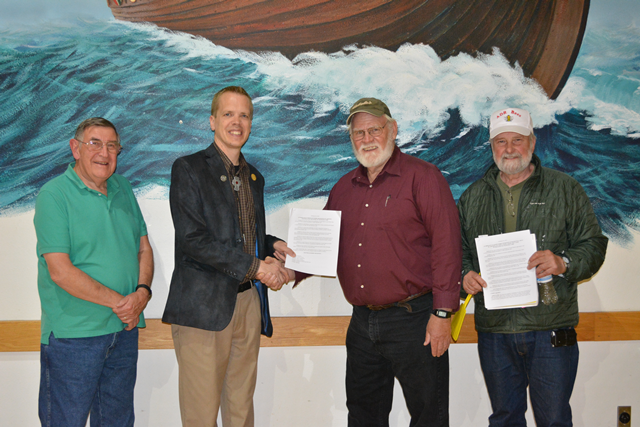 Mayor Sam Kooiker (May 2015) congratulates Bee Club on Ordinance Allowing Beekeeping within the City Limits. Shown from left, Tom Allen, immediate past president, Mayor Sam Kooiker, Bob Asheim, current President, Jerry Owens, Club founder. Photo by Dustie Ree. Tom Allen was the presenter at the May, 2015 meeting. 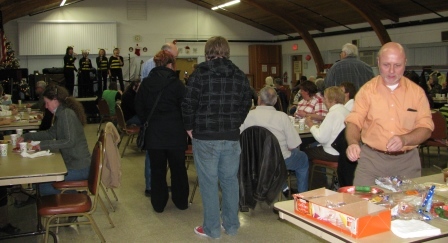 Once again — we had excellent turnout for the May Wannabee Club meeting. At the April, 2015 meeting, Dan Mulally gave a presentation on the Flow Honey System (see link in next section below) as well as the pros and cons of the common honey bee breeds. See more details in the April, 2015 meeting minutes. Flossie sent this article (02/2015). Very good video of the Flow Honey System. 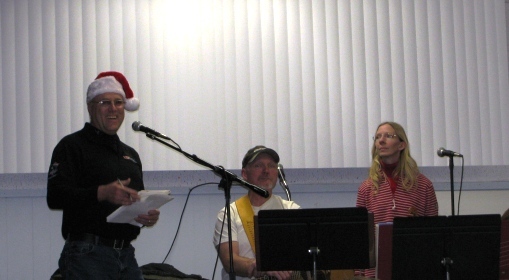 The 2014 Christmas Party had a great turnout again this year with wonderful food, great conversations with friends and fantastic entertainment by the Bear Butte Bluegrass Band and the funny and talented Bee Team (part of a larger acapella group, the Dynamics). Here’s wishing all of us a great 2015 and prosperous bee keeping !! Assistant City Attorney Allison Marsland attended our July 2014 Wannabee Club meeting to observe and answer questions. She stated that it will take 4-6 weeks to research and draft a new ordinance pertaining to whether honey bees will be allowed within city limits on non-ag land and, per law (as it would amend Zoning Title 17.10.20), it must be presented for 2 readings in front of the Zoning and the Planning commissions. They are hoping to have an ordinance completed in 6 weeks so by mid-to-late August. Their office will inform Tom Allen and John McDowell when the public hearings regarding this and the reading of the ordinance will take place. These are public meetings so anyone can attend and voice their opinion either FOR or AGAINST the keeping of honey bees within city limits. Two members mentioned that, even if you do not live in Rapid City, this issue is very important for whatever town/city you do live in. What Rapid City decides will have an effect on what other towns/cities do in the future. We want Rapid City to be on the leading edge of this decision and to support honey bees. Please contact one of the above committee members with your ideas. From President Tom Allen: I shared this info at the March 12, 2014 meeting, but if you weren’t able to attend, here is a list of webinars put on by OSU Bee Lab. I listened to a lot of them last year and they have them archived so you can go back to check them out. Access to the site is https://u.osu.edu/beelab/courses/. From there click on the Courses/Webinars link and you will be invited to join their email notification list so you get a reminder a few days before the next one. The first one is March 19th at 9:00 am Eastern time. Or during breakfast here in Mountain time. This first one deals with phenology and how we can use it to study how the environment/weather affects the bees (pollen gathering/nectar flow, etc.). Hope you all enjoy!! South Dakota State University ‘Bayer’s Bee Care Tour’ seminar. Don’t miss the chance to experience Bayer’s Bee Care Tour at South Dakota State University. The Tour is a part of Bayer’s effort to foster education and collaboration among growers, beekeepers, researchers and others interested in engaging in topics related to honey bee health. 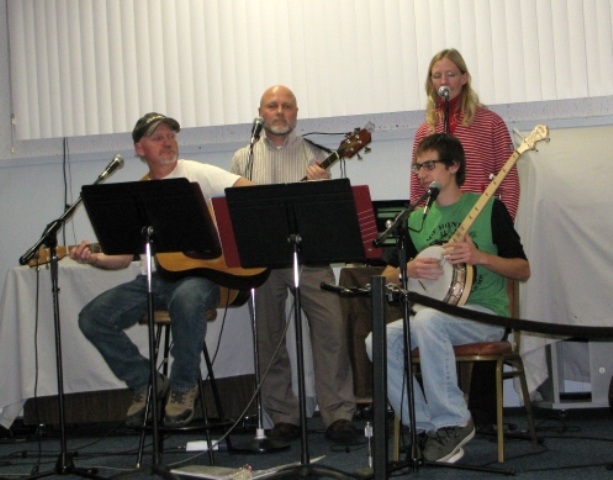 December, 2013 meeting – potluck – great, great music and lots of fun. 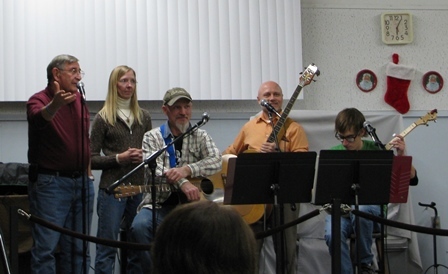 Thank you so much for the Bear Butte Bluegrass Band. What a wonderful and entertaining night. Some bluegrass mixed with Christmas tunes. You guys are great!! And so many different varities of honey. That was fun. Here is our 2012-2013 President giving some announcements. Thank you Bill Clements for a great 2 years as president — and still smiling. And once again, it was honey tasting time. So many different flavors of honey — and colors and tastes. Thanks to all who brought their honey in. The following video was shown at the October meeting. It is Marla Spivak discussing why bees are disappearing (filmed June, 2013). 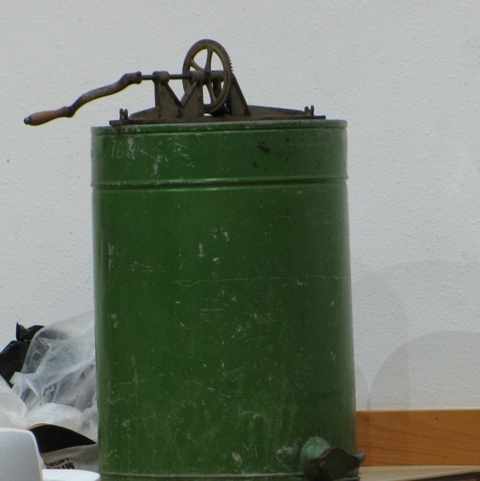 At the September 2013 meeting, one of the members brought their vintage extractor and Bill Clements brought his new extractor for a demonstration. Note that Bill and Joan use sandbags to keep the extractor from moving around. 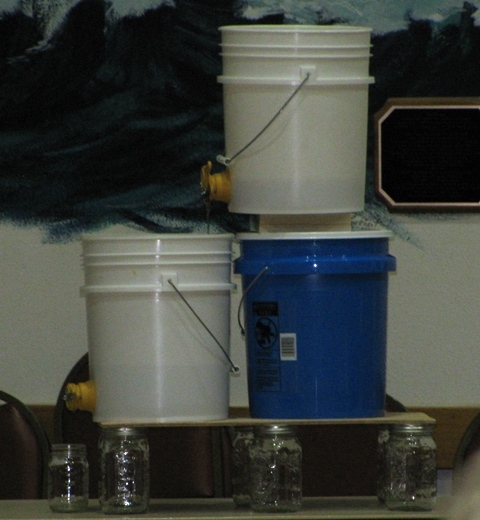 Bill also demonstrated how he filters his extracted honey into a 5 gallon bucket. Someone called Jerry to take a look at this bumble bee nest. He provided the following picture and as he stated — Awesome! T he smell from a banana (isoamyl acetate) mimics the honey bees alarm pheromone causing them to go into attack mode. Initially the attached blog says bananas do not contain isoamyl acetate (or banana oil), but later in the blog they correct that information. So do not handle or eat bananas before working with your bees. So what else may make honey bees sting? Chewing juicy fruit gum, anything made with banana oil (isoamyl acetate) such as juicy fruit gum, nail polish, some shampoo. Read more at this BeeSource link or this wikipedia link. Honey Bees and Beekeepding 1.1 – A year in the life of an Apiary (you tube video submitted by member Bruce Johnstone). At the March 12, 2013 Bee Club Meeting, Tom Allen gave a presentation on what to plant for pollinators. You can donload the power point presentation from this link (it may take several minutes) Planting for Pollinators Slide Show OR you can open this version of the power point as a PDF: Planting for Pollinators PDF. Tom Allen sent a link to this site that has numerous videos on how to make various beekeeping gadgets such as a solar wax melters, honey bucket heater, hive stand, etc. 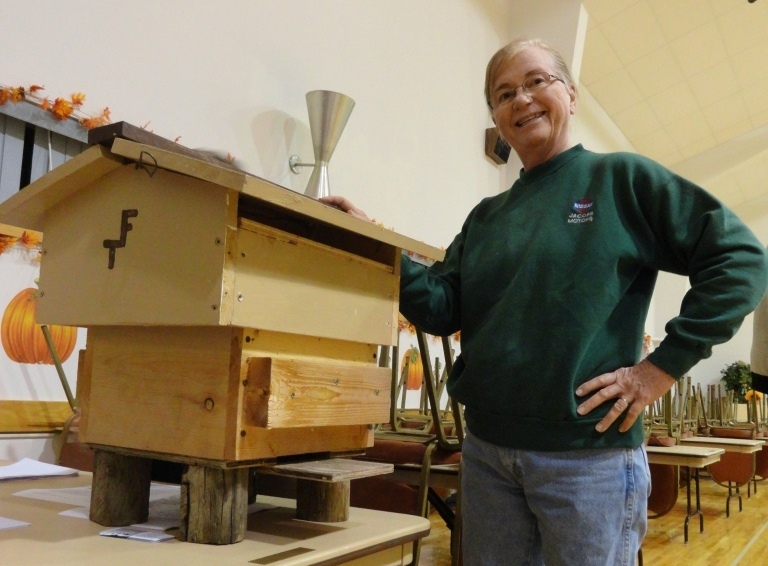 Florence Thompson (Flossie) built her own Warre top bar hives — see November 2011 Meeting Minutes for details. 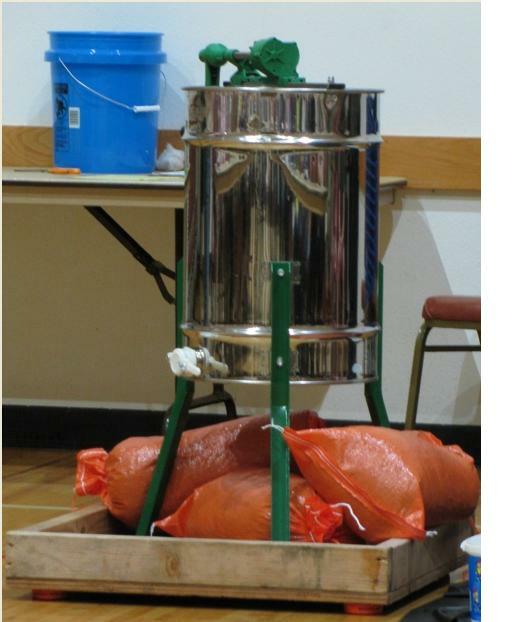 Flossie found this web site that discusses in detail how to build a simple bee vac. It gives a detailed inventory list complete with pictures and instructions, with comments at the end suggesting improvements. It’s located at the Top-Bar Bees website. 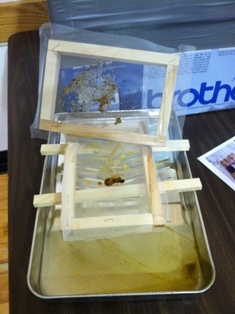 Note: Bill brought a mini-solar wax melter to the November meeting — see November 2011 Meeting Minutes for details. For the September, 2011 meeting, Bill and Joan Clements brought in a solar wax melter they made using a cardboard printer box, a window, some insulation around the inside of the box – sprayed with black paint, and the handy-mans secret weapon, duct tape. Bill made 2 small wooden frames – over the lower frame he stapled fine screen mesh; over the upper frame is normal screen-door screen. Two sticks hold the frames up from the metal paint roller pan. Bill places the slum-gum/wax on the upper frame and closes the lid. As the box heats up, the wax drains through the top screen to the lower screen which further filters the sludge and clean wax drips into the paint roller pan. Bill says it heats to 150 degrees within about 1-1/2 hours and that’s enough to melt the wax. Be sure to use gloves to remove the hot paint roller pan and pour your freshly screened wax into another container for later use. Thanks Bill & Joan for a fantastic and inexpensive idea !!! 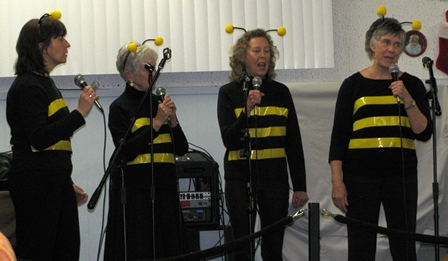 August 22, 2011 – 6:30 PM — Jerry Owens “The Bee Man” will give a Hobby Bee Demonstration on the Knology Stage at the Central States Fair. Orchid was in Florida recently and saw a very good independent movie. She said it was artsy and makes an environmental impact point about the importance of bees in our world. Here is a link to The Queen of the Sun movie. Lee has been working with the Nebraska University faculty about their Master Beekeeper Program and is hoping to arrange that their next 3-day program (2012) be offered in Chadron, NE – if – we can get enough interest from our local beekeepers. Lee passed around a poll-sheet during the June, 2011 meeting to get an idea of who would be interested. If you were unable to attend the meeting and are interested, contact Lee at lee@leealleyrealestate.com or (605)863-0806. Build you own Extractor ?? 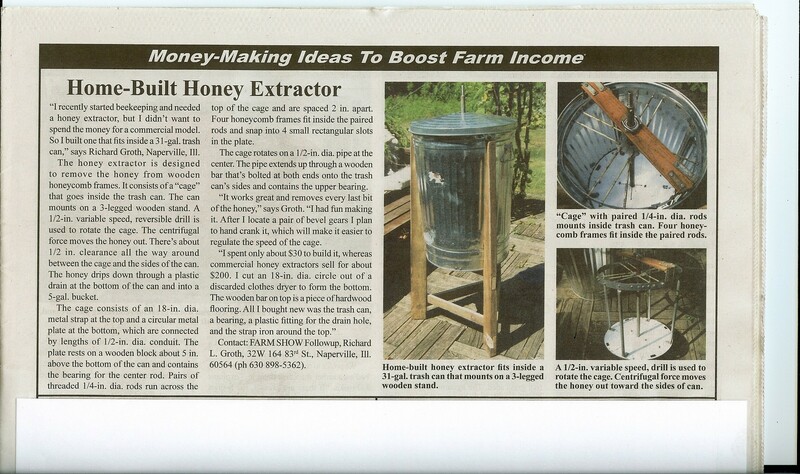 Mike and Brenda ran across the following article in a farm show magazine on a home-built honey extractor. You can click on the image below to see it in full size. 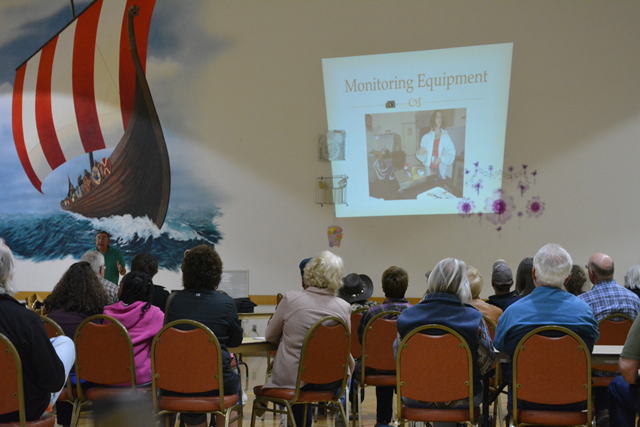 Our monthly meetings begin at 6:00 PM on the 2nd Wednesday of the month at the Canyon Lake Senior Citizens Center. April 13, 2011 — Troy Dean gave a timely demonstration and presentation on splitting a hive. 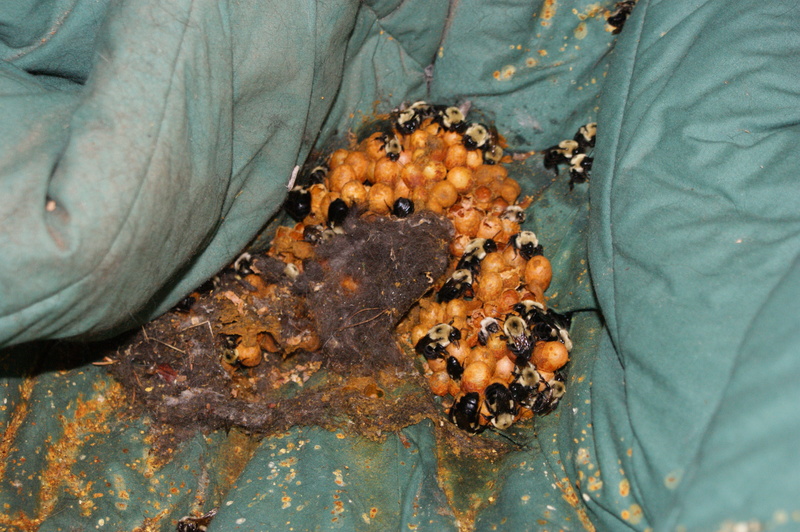 It was recommended that members do some research about hive splitting before the next meeting. Here are 2 links that may be useful.